It’s amazing watching this little guy grow from a tiny, 100% dependant little baby who cried all the time into a (slightly) independant little boy who likes to do things his own way or no way. He is trying his hardest to assert his independence… but I secretly smile because I know that it will be years (YEARS, BUDDY!) before he will actually be independent. It’s endearing to see him attempt to prove his boyhood, though. From pushing my hand away while I’m trying to feed him, to “arguing” with me over nap times, Nathan is making it abundantly clear that he is no longer that little bitty baby. He’s growing up on me. So I take pictures to capture these moments of blissful while they last. 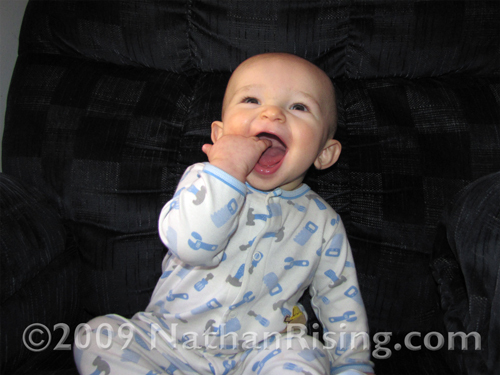 This entry was posted by Jen on January 23, 2010 at 11:47 pm, and is filed under All About Nathan. Follow any responses to this post through RSS 2.0.You can skip to the end and leave a response. Pinging is currently not allowed.